FREE DOWNLOAD & Special Edition CD-R Compilation! In conjunction with DUNG’s first Pinas Tour this weekend, we’re planning for a CD-R release to share with our friends there. It is a collection of songs recorded from 1993 to 2007 – several from the yet unreleased album Inginku Rejam Raksasa Kejam (I Wanna Destroy the Heartless Leviathan) and rare compilations. Notes on the tracks and also lyrics are included. *excuse the varying sound levels, we didn’t have much time to prepare this proper. Enjoy! FOR WINDOWS: ultimatezip.en.softonic.com – FREE! FOR MAC OS X: unrarx.com – FREE! 2. Download both part 1 and part 2 of the rar files. 3. Double-click on part 1, and the software will start and de-compress both files into a folder. PLEASE PASS THIS AROUND TO YOUR FRIENDS! thanks victor, roddy & everyone. cheers. roddy, sorry if i’ve gone off the map regarding your release and the tour. will be writing to you as soon as the job eases up. Hi! thanks for music, it’s perfect. When you will have next concert? Ahh… this brings back memories… Been a follower since 92-93 (cant even remember haha). Lan Bear even replied my ‘fan’ mail at the time. Joe, I’m really desperate to get my hand back on the Circle Of Friends album. Need to hear Daffodils and all the other great songs on that album again… Can u help me out bro..? good luck for Philipines TOUR julai 2010. CARBURETOR DUNG…the name that is still standing strong and marching all the way through every challenges day by day, years by years… You guys really ROCKS!!!! Joe Kidd and his co. is all my heroes from my childhood until today… stand strong guys…! Love this! CARBURETOR DUNG in my heart! not so rapunk but am so you gonna enjoy it. excuse the older stuff though, i cringe! Thanks Jo and co, made my (wintery) day. Shoulg go down a treat salving over the computer at work tommorow! 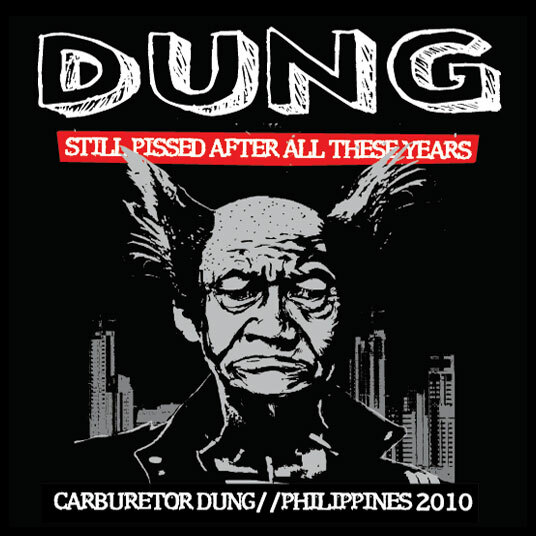 Previous story DUNG Pinas Tour T-Shirts – SOLD OUT! !